Don't you find that once in a while you come across a person that just gets you. It's easy, effortless and they are so much fun to be with. I have so many wonderful friends in my life and I am lucky to add another one to the mix. We catch up a few times a week to purely drink tea, sit on the couch and share whatever is on our minds. Whether those topics are good, bad, happy or sad we share it all. Trust is a hard thing to build and I know I can share anything with this woman. So whilst Jes and I have been catching up, I thought I would share some of our shenanigans with you. Last week we decided our bodies had been neglected and we wanted a total nurturing day which we both deserved. Jes is running a marathon next week so her training has been insane and I have been training too, YES less kms but training all the same. So off we went to my favourite place "Bronzalicious" and decided to get a little body love. 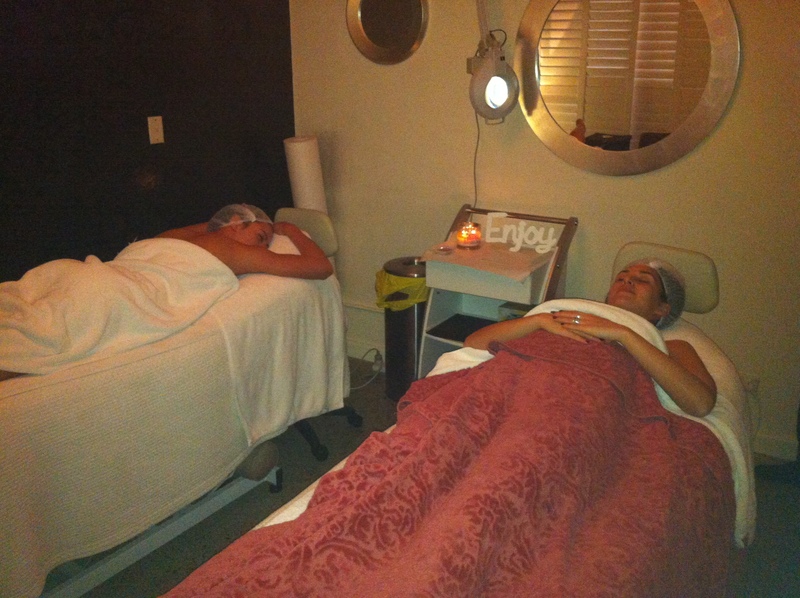 Jes had a exfoliation and Neck and Dec massage and I had a Facial and Peel... This is new to me. I had no idea what a peel was?! I generally just use my beloved Sodashi products and drink lots of water. But to be honest I have been noticing some fine lines and rough skin (both things I am not to concerned about) But I thought why not! So I spoke to my chicas at Bronzalicious and they suggested this particular treatment. The girls there are divine and made us so comfy and cosy on the beds that were heated with electric blankets.. We were feeling very spoiled and shared many a giggle and that's when the real magic began. So let me explain peels for all of you that have never had one. When doing peels its best to first prep your skin with an active serum, depending on your skin type and the peel that will be used. This should be done two weeks prior to peels, this helps to get the maximum benefits from peels and to receive optimum skin health. It is best to do them on a weekly basis, over a period of six weeks doing this twice a year. Then can have monthly maintenance peels throughout the year to pro long the results. I have decided to do this now so I have glowing skin for the wedding. Revitalizes dry mature and sun damaged skin, evens out skin tones, minimizes the look of fine lines and wrinkles. I am looking very Zen in that last pic. Peels with salicylic acid help to break down congestion/clogging of the pores. Great for breakouts. You shouldn't exfoliate your skin 3-4 days after having a peel treatment. Always using sunscreen through out peel course because the skin becomes more sun sensitive. Only use a mineral make up after treatment, mineral make up doesn't clog the pores of the skin. So after this amazing treatment my skin felt gorgeous and I asked what I can do to get best results and as well as getting frequent peels which can be costly. They have something called the "Skin Inject" take home pack which is skin needling system (sounds terrifying but I am assured it's not) and worth the cash if you want best results. It gets the skin to penetrate the products you use. Jes and I were totally Zen when leaving the day spa but my body was still screaming out in pain! It was time to get a Thai massage. I love how they stretch you out and really get into those sore spots. Maude was on her way to meet us so I thought lets all go together. I have never yelped and cried out aloud in a massage before. Jesinta found this hilarious and Maude was in her own world of giggles (this happens if you touch her too much). We all came out frazzled and flushed. Yet relaxed all at the same time. Nothing like a good bonding session. Since then Jes and I have been talking about documenting one of our MBS per week. Whether that is a nourishing cooking class, dining somewhere fabulous, seeing a psychic or reading books on feminism. We want to share it all with you.